Once is the stage adaption of the 2006 film of the same name. It’s based on the book written by Enda Walsh, about an Irish busker and a Czech flower seller. After a season at the New York Theatre Workshop, it transferred to Broadway and became a musical sensation, winning 8 Tony Awards, including Best Musical. The song Falling Slowly won the Academy Award. On April 9, 2013 it opened at the Phoenix Theatre in London’s West End. ‘The Guy’ and ‘The Girl’ leads – Declan Bennett and Zrinka Cvitešić signed for me at the stage door after a Saturday matinée performance on 18 May. 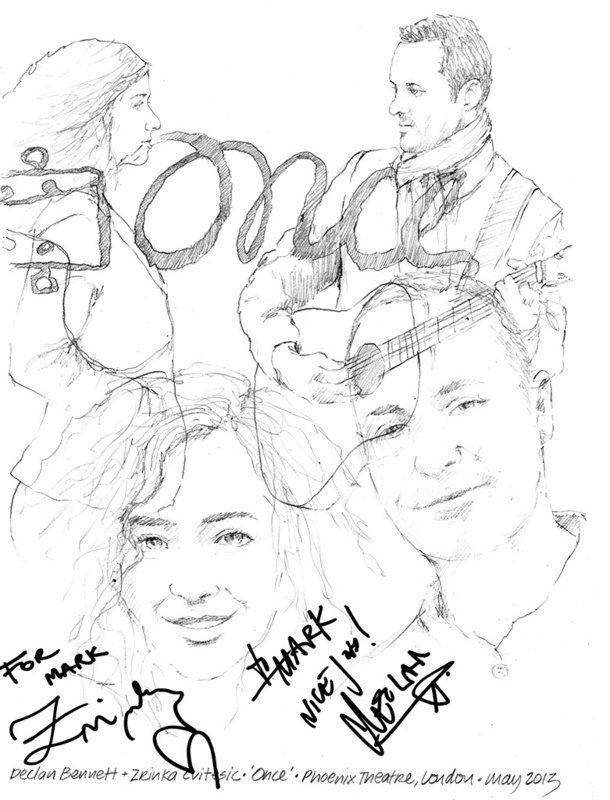 This entry was posted in Celebrity, Theatre and tagged Autograph, Broadway, Declan Bennett, Drawing, Once, Phoenix Theatre, Signature, sketch, Theatre, West End, Zrinka Cvitešić by Mark Winter / Chicane. Bookmark the permalink.